Paul and Debbie Salvetti’s 13 year old adopted son escaped imprisonment in a room of their home by kicking through a wall into another bedroom. He went to his former public school the next day to notify a staff member there about the abuse. He weighed 87 pounds at the time of his escape, two pounds less than he had weighed two years prior. The teen gained 10 pounds in four days after being removed from his adoptive parents’ home. He stated that his adoptive parents had removed him from public school and homeschooled him in order to prevent him from telling administrators about his treatment. An investigation had previously been opened when he told school officials that he had been fed poisoned food and hit with a baseball bat and a frying pan. He reported that the only homeschooling he had done was journal writing and that he was expected to earn food as a privilege for obedience. He had been locked in a room with only a mattress and a bible, allowed out for brief dinnertime meals. The room’s windows had been painted black and boarded up, the door locked from the outside. All four of the Salvetti’s other minor children were removed from the home. 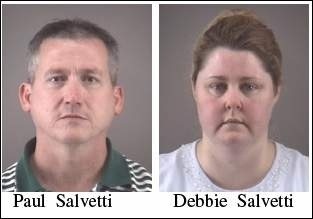 Paul and Debbie Salvetti lost an appeal and were sentenced on felony child abuse charges.